Our diet includes many different types of components that can be divided into various categories. The different components have different nutritional values and are required by the body in varying quantities. We get these components from different foods that we eat; some of these foods have high nutritional values whereas some have low. In the same way, some foods that we consume have more of a certain component whereas some have less of the same. We divide food items into categories of fats, carbohydrates, proteins, vitamins, minerals and so on. All these have varying requirements and some people require more of some than other. Yet there are some who require too much of a certain component; due to a deficiency or some other need and therefore take supplements. What we discuss in this article are two such components that are part of our diet without us actually knowing about them. These are casein and whey which are very important for the body and have a high nutritional content. Whey, which is also known as milk permeate or milk serum actually refers to the liquid that remains after the milk has curdled and strained. When casein or cheese is made, the whey is obtained as a by-product. There are various types of whey; sweet whey and acid whey are among the most common. Sweet whey is obtained as a by-product when rennet type of hard cheese is manufactured. This includes cheddar, Swiss cheese etc. Acid whey (also known as sour whey), is also a by-product but of the manufacturing process of various acid types. Note that these acid types are of the dairy products including strained yoghurt, cottage cheese etc. In contrast to this, casein is the term that is used for a family of phosphoproteins that are related and include αS1, αS2, β, κ. These proteins can commonly be found in mammalian milk, that is, milk produced by mammals. They make up about 80% of the milk obtained from cows and somewhere between 20 and 45% of human milk. The uses of casein are many; it is used in the making of cheese, as a food additive, as a binder for safety matches etc. It has high nutritional content as it contains amino acids, carbohydrates and two very important inorganic elements, calcium and phosphorous. Note that one of the only similarities between casein and whey is their association with milk. Casein is a very important product and is usually produced in large amounts. Whey, on the other hand is produced as a by-product when casein or cheese is manufactured. Recently, however, the uses and significance of whey have become well known to many and it is demanded by a number of groups of people. Both casein and whey are in high demand by body builders who take supplements to aid muscle growth. A very important effect of whey on the body is that whey stimulates protein synthesis. It is digested very quickly which means that it causes a large increase in the amino acids in the plasma. Protein breakdown is not effected but protein synthesis is speeded up. Whey has a high level of leucine which is a potent amino acid and stimulates the making of protein in the body. Casein, however, does not stimulate the synthesis of protein but in effect, ensures a positive protein balance. It is the most abundant protein found in milk, which, in milk processing, becomes denatured or disturbed due to the heat or acid. Gelatinous results and this accounts for the slower digestion of casein. allana. "Difference between whey and casein." DifferenceBetween.net. 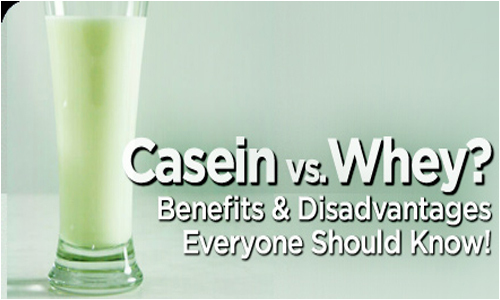 November 25, 2014 < http://www.differencebetween.net/object/comparisons-of-food-items/difference-between-whey-and-casein/ >.